Catching Up with Clio's Creatures - History? Because it's Here! Old Abe, the Civil War Eagle, fought with the Eighth Wisconsin Regiment for three years. As a Civil War veteran, he helped raise money for wounded soldiers. From 1861 to 1864, Old Abe served the Union Army well. He led his comrades into battle at least 16 times, according to one tally. If the government had awarded Purple Hearts, then Abe would have earned two of them since he was wounded at Vicksburg and Corinth. 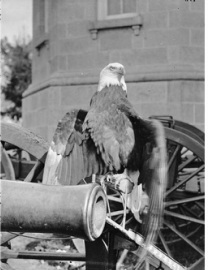 Although Abe was battle scarred, he lived to become a veteran, which made him more fortunate than many of the soldiers from his Eagle Regiment who died from wounds or disease. 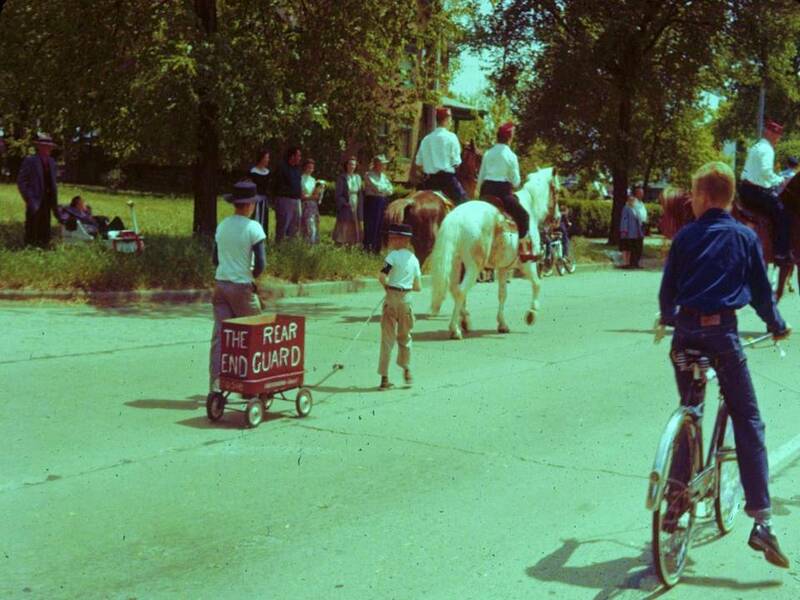 When Old Abe and his regiment marched through Madison, Wisconsin, in September 1864, he was limber enough to pace his perch and inspect the cheering crowds. Abe got more attention than the soldiers did! In the winter of 1864 at the Chicago Sanitary Fair, Abe raised $16,000 for the agency that did the work that the modern Red Cross now does. After the Civil War ended, the soldiers from Abe’s regiment presented him to the State of Wisconsin and state officials gave him the peacetime job of state mascot. One of the fringe benefits of his job included a roosting room in the basement of the state capitol and his own personal valet. A soldier by the name of Johnny Hill was appointed to be Abe’s valet, which suited Abe just fine. He and Johnny dated to the time when Johnny’s cabin stood within sight of Abe’s treetop aerie. They enlisted together in the summer of 1861, and became such close friends that when Abe went on the state circuit, Johnny Hill became his chaperon. The state circuit made Abe more of a celebrity. People from all over the country came to visit Abe and grab souvenirs if they could. His molting feathers sold for $5.00 each and when the demand exceeded the supply, rumor had it that carefully matched chicken feathers had been substituted for the real thing. Abe’s popularity continued to grow and he became a national celebrity. At the convention where General U.S. Grant was first nominated for president, Abe stood on his shield screaming his victory scream for the General, of course. Monetarily speaking, Abe and Johnny Hill could have been rich if they had chosen to hoard his earnings. The proceeds from his picture sales added up to thousands of dollars, but the money was used to aid disabled soldiers. A St. Louis businessman offered to buy Abe for $500.00. P.T. Barnum dangled a $20,000 inducement to use Abe as a circus attraction, but by this time, Abe was such a favorite son of Wisconsin that even big money couldn’t tempt Wisconsinites to sell their eagle. Abe was so popular in Wisconsin that it required a special legislative act and approval of the governor to permit him to leave the state to attend the Centennial Exhibition in Philadelphia in 1876. When Abe arrived, more people came to see him than Alexander Graham Bell’s telephone, which was being demonstrated for the first time anywhere. Death came to Abe as he had lived during his Civil War years, in smoke and flames. The warrior eagle who survived two battles and countless skirmishes, suffocated in a small fire originating in a pile of waste paper. The date was March 1886, and all of Wisconsin and American paused to mourn his passing, from governors to rough-hewn northwoods lumberjacks. Abe’s remains were artistically stuffed and mounted and for many years occupied a place of honor in the capitol rotunda in Madison. Then on February 27, 1904, history repeated itself. Fire struck the state capitol and Abe’s remains burned along with the capitol building. Images of Old Abe still linger in the form of a granite statue guarding the entrance of the old Civil War training ground at Camp Randall in Madison, Wisconsin. And a mounted, feathered likeness of Old Abe has guarded the speaker’s desk in the state capitol at Madison since 1915. In stories about Old Abe and books about the Eighth Wisconsin Regiment, Old Abe's voice can be heard over the boom of the guns. Catching Up with More Clio's Creatures!